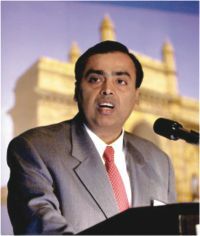 Mukesh D. Ambani has been the Chairman and Managing Director of Reliance Industries Ltd., since July, 2002. Elder son of late Dhirubhai Ambani, founder of Reliance Industries, he is one of the most influential business leaders in the world. Kishore Biyani is the Chairman and Managing Director of Pantaloon Retail Ltd. He is also the Chairman of Future Group. He founded Pantaloon in 1997 and is widely considered as the father of modern organized retail in India.